One of the most well-known rivers in the entire United States, the Hudson River measures up at 315 miles in length, starting off in Upstate New York in the Adirondack Mountains and flowing all the way down through the state, finishing up in the Atlantic Ocean at New York Harbor. It's one of the most stunning waterways in the world, traversing a rich tapestry of natural and urban environments, and a perfect site for kayaking adventures. In fact, kayaking on the Hudson River is becoming increasingly popular in modern times, with countless visitors from all over America and the rest of the world flocking to New York and signing up with the many kayaking tour companies operating all along the river. Kayaking tours and rentals allow you to take a totally unique trip along the Hudson River, taking in all of the magnificent sights and sounds of the area. Whether you’re an experienced long-time kayaker or just looking to give this activity a try for the very first time, the Hudson River is a great place to paddle. If you’re looking to do some kayaking on the Hudson River, there is a whole host of options available to you. The Downtown Boathouse, for example, situated at Pier 26 in the Hudson River Park, offers free public kayaking for all. This non-profit organization is doing great work in New York City, offering a super way to spend a day with friends or family. The Manhattan Kayak Company, meanwhile, offers a wide range of beginner, intermediate, and advanced kayaking trips around New York City and along the Hudson River. 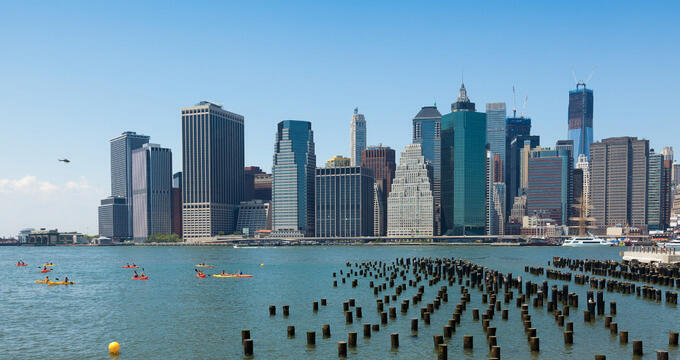 All of these trips have been designed to offer stunning views and memories that will last a lifetime, taking in several iconic landmarks like Coney Island, the Statue of Liberty, the New York City skyline, the George Washington Bridge, and much more. This kayak company, as well as several others, also offers kayaking lessons and classes. Introductory courses can help to teach people the basics of paddling and kayaking from the comfort of dry land, while more advanced classes take students out onto the Hudson River itself to put their skills into practice. Many people can be a little apprehensive about heading in a kayak for the first time, but these lessons really help to put one’s mind at ease and provide the confidence needed to enjoy stress-free kayaking. I Paddle New York is another great kayaking company focused on the Hudson River, running a fun mixture of relaxing tours along the water. Guests can sit back and take it easy as they glide along the river, appreciating incredible views in every direction and listening to the gentle splashes of the Hudson River against their kayaks. Tours are run at all times of day, including several options during sunset or in the evenings. Everyone knows that New York is the “city that never sleeps”, and it can be a truly breathtaking sight to head out on the Hudson River in a kayak and take in all the lights of the city’s skyline after dark. Sunset tours are also highly popular, with a mixture of reds, oranges and yellows lighting up the horizon and providing the perfect backdrop for your kayaking journey. As previously mentioned, the Downtown Boathouse runs free kayak rentals in New York City, but many other companies provide kayaking rental opportunities too up and down the Hudson River. These are ideal for people who want to forge their own paths and explore at their own pace, free from any schedules or timings. Whether you’re looking to take in the sights and sounds of the Big Apple or explore the more natural environments of upstate New York, these rentals cover all bases and provide a wealth of opportunities for outdoor enthusiasts. Friendly guides are always standing by with various companies to provide tips and route suggestions, and there’s a whole lot of water to cover along the Hudson River, so you can come back time and time again for new adventures and experiences. Paddling along the Hudson River is a joyful experience at any time of year, highly popular with families and children. The river features plenty of calm sections providing perfect kayaking conditions, especially for beginners, and if you're just starting out with kayaking or looking for a super spot to enjoy the water without being crowded by lots of other tours and tourists, the Hudson River is an ideal location.